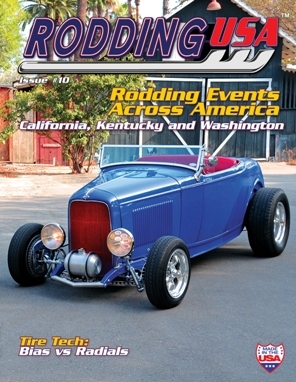 Rodding USA magazine's Issue #10 available to order now. Issue#10 features all your favourite traditionally-styled hot rods. Event coverage includes a taste of the 50th Anniversdary LA Roadster Show plus we go Nostalgia Drag Racing in Kentucky. There's an excellent tech article on tires where we compare bias-ply to radials There’s a lot on offer in Issue #10 as you can see, and don’t forget our regular features, opinion, art, new products, news and a list of dealers. Rodding USA, by hot rodders, for hot rodders.